These statements have not been evaluated by the FDA or the TGA. The product discussed is not intended to diagnose, treat, cure, or prevent any disease. people this biological age is generally 20-50 years older than their actual chronological age. Since it is our biological age that determines the length of our life, that number is quite significant. More than 3 years of testing and research have led me to the discovery that drinking Kangen Reduced Alkaline Water is the most effective tool for quickly, easily and economically changing the rate of oxidation on cells that I have ever encountered. One can therefore say that drinking ionized Kangen Water has the potential to slow the aging process. The powerful component of the water that does this is the ORP (Oxidation Reduction Potential) charge on the water. This negative ORP part of the water is what causes this water to be able to slow down the oxidation of our bodies. As the cell walls of our body become oxidized, they become sticky and this prevents hydration of the body as well as nutrient absorption and cell waste to be expelled. The -ORP removes oxidation from the cell wall and allows for better hydration, and cell metabolism and overall cell health.” - Dr. Peggy Parker, Naturopathic Physician, Biological Medicine. Internationally renowned teacher and lecturer. Dr. Thomas Rau, MD is the Chief Medical Director of the Paracelsus Clinic in Switzerland, and founder of Paracelsus Biological Medicine. “If you can bring about a shift in a person’s pH by making it slightly more alkaline, and reduce the state of oxidation in the body and get minerals into the cells, the body can heal itself of anything”. 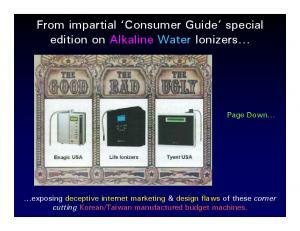 Report "Doctors viewpoints on Alkaline Water"